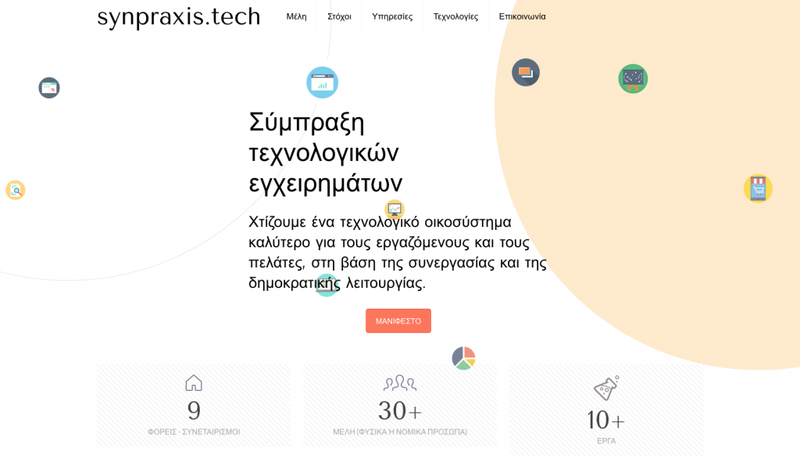 We participate in Synpraxis (means co-acting in greek) since it’s foundation in 2017, a digital commons coalition in Greece bringing together teams from different backgrounds to work together on promoting digital commons as well as share experience, skills and projects. We believe in a fairer world in which wealth and resources are distributed to the people who need them and not necessarily to those who can best take them away. As co-operative technologists we want to ensure that technology plays a positive role in creating a fairer world. Individual cooperatives that make up the partnership have shown that when employees collectively hold their companies and drive decisions, they build more friendly workplaces, produce better and create superior digital products.We call on the technicians who meet our vision to come with us. We call on users of digital products and services – including professional associations, charities, governments and private companies – to reject the misconception that only multinational companies or private equity funded companies can be high tech companies. Technology is the basis on which humanity will stand, not a vehicle for a few privileged. We want to send a message to technology companies that do not treat their employees fairly, do not give employees a reason for business decisions and do not seek to create a fairer world that their days are measured. We are more creative, more dedicated and more resilient. Come with us!